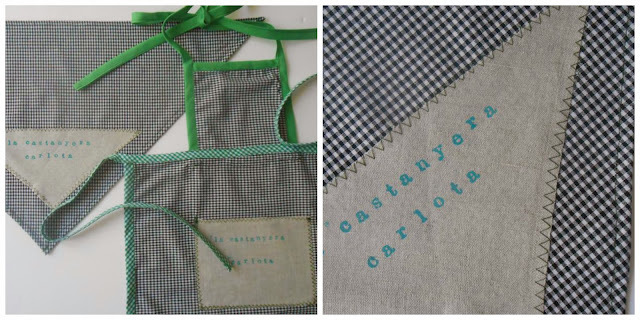 The teacher asked the children that wore a clothing like " La Castanyera "
It's my first handkerchief and my first apron! and I'm glad I made ​​this decision! Gradually I sew something! and I do not I make as many mistakes like at the beginning!
" Castanyera " that ever exist in this world! 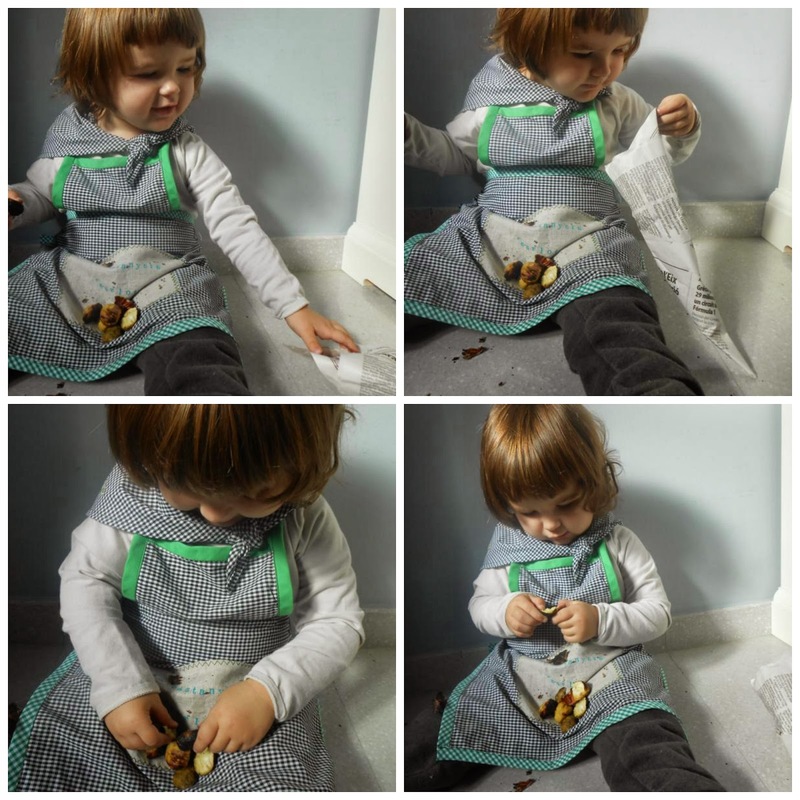 my daughter and made a traditional style apron. Note: I edit before posting, today celebrated " La Castanyada "
in kindergarten. And she came out disguised of " Castanyera ". 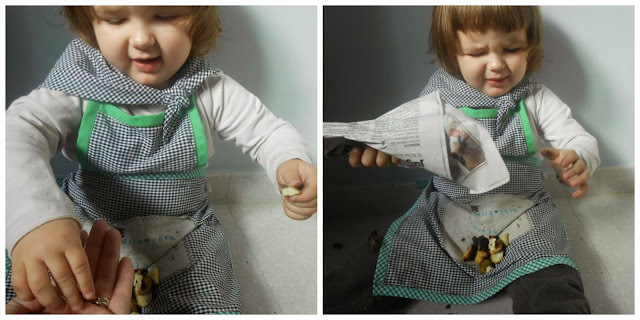 And she wore a paperina (wrap made ​​with newspaper) with chestnuts. When we got home she wanted to show me what was inside the paperina. What is inside the paperina... ? Roasted chestnuts! 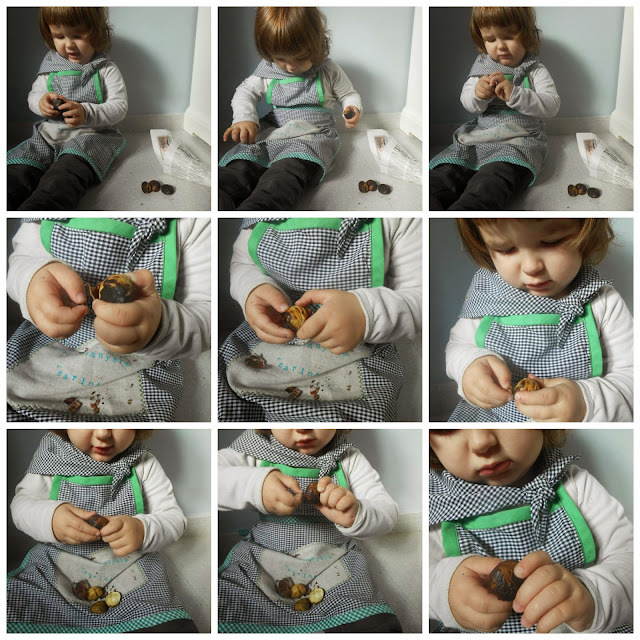 you see how she herself was peeling his chestnuts? All single she ... there's more ...? I give him the mother and ... I cry because they been finished! Mother's love ... of course! 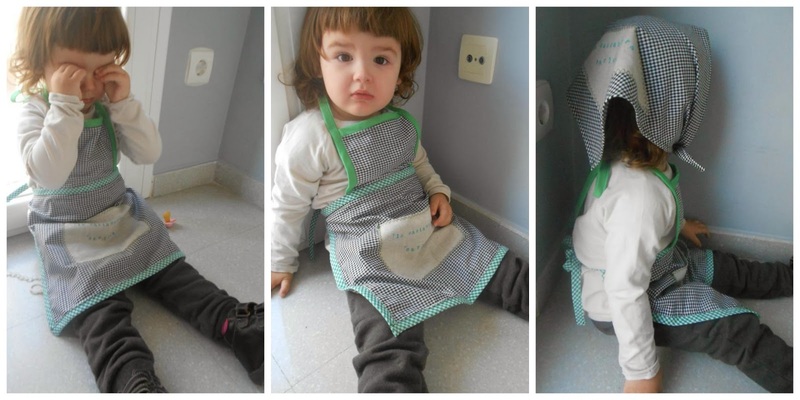 And too today after lunch, Carlota was very tired and slept a lot. On time when she going to school was still sleeping! and when she woke up it was too late to go to school. So we have spent the afternoon together. she also wanted to dress the apron to go shopping! and the afternoon snack delicious! Thanks Rosa for the recommendation! song title is very Catalan too: Pa amb Oli ( Bread with Oil ). I love this song and I love the video. And you, you like it? and I wish too a good Halloween to you all!! Carlota Castanyera is really beautiful!!!!! love the set you sewed for her!!!!!! 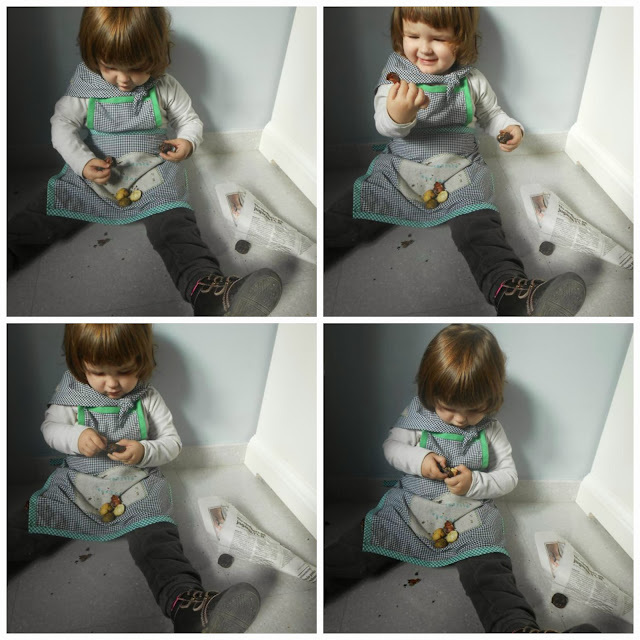 Your year of sewing has made you more confident to try your hand at new items without pattern. Good for you. Daughter is beautiful-even when she doesn't want photo. Happy November to you both. Una castanyera molt bufona!!! Blaumunt m'agraden molt!!! I la castanyera està guapissima!! Un petonàs i bona castanyada!!! Cristina, m'encanta la castanyera que tens, quin amor de nena ! M'agrada molt la foto de les seves manetes molsudes pelant les castanyes i el davantal i el mocador que li has fet són una autèntica monada ! Aquesta màquina de cosir serà un no parar !! 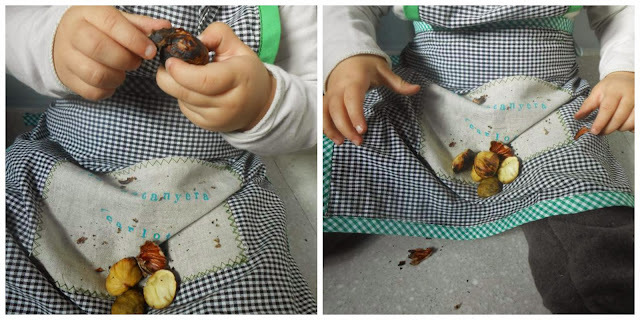 Quina castanyera més súper xula!!! Estic flipant!!!!!!!! Quina monada de castanyera!!!! Fins i tot quan s'enfada està per menjar-se-la! T'ha quedat un conjunt de davantal i mocador PRECIÓS!!!!!!!!! Segueix així guapa! Muaaaaaa!! XD però quina passada de castanyereta!!!! No m'agraden gaire les castanyes, però aquesta castanyera me la menjaria amb castanyes i tot!!!! 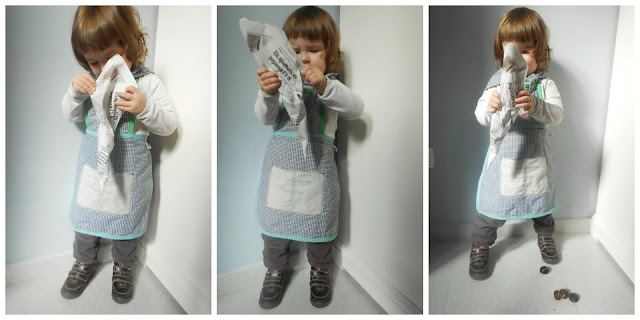 Està guapíssima, quin conjuntet que li has fet! 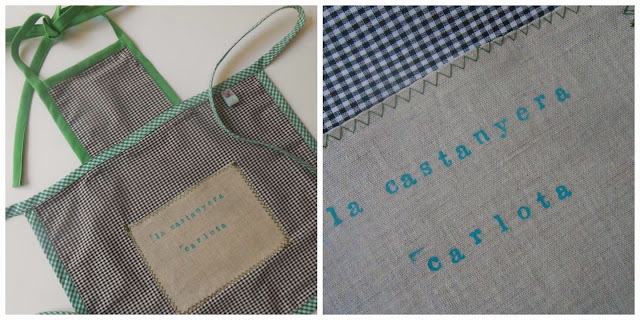 Treus idees de per tot! Quina castanyera més original! M'encanta com et va quedar! Felicitats!! !